Britain's main opposition Labour Party has formally backed calls for a second referendum on Brexit, after parliament rejected its alternative plan to leave the European Union. The party is expected to table an amendment pushing for another public vote on the UK's EU membership when the prime minister presents her revised Brexit deal to MPs on or by March 12. Labour leader Jeremy Corbyn has said he will also continue to argue for other "available options", including a general election. Two backbench Labour MPs have proposed a compromise plan to support Theresa May's deal, on condition that it is then put to a public vote for approval. In a response to the huge parliamentary defeat in January on the original UK-EU withdrawal deal, the prime minister dismissed calls for a second referendum. The United Kingdom voted by 52% to 48% in June 2016 to leave the European Union. However, as the exit date at the end of March draws near and with no deal in place, the latest developments in the UK parliament have opened the door to the possibility of Brexit being delayed. Although EU leaders are open to a postponement, chief negotiator Michel Barnier and French President Emmanuel Macron have suggested that the UK might need to provide a good reason. The other 27 EU countries would need to agree unanimously on an extension to Article 50 – and might insist on conditions. Some believe a short delay would likely achieve nothing, while a longer extension either might be subject to a new referendum or would almost certainly bring increased calls for one. At the moment it is thought unlikely that there is enough support in the UK parliament to hold another public vote. At least two dozen Labour MPs are thought to be against, while only around 10 ruling Conservatives are believed to be in favour. 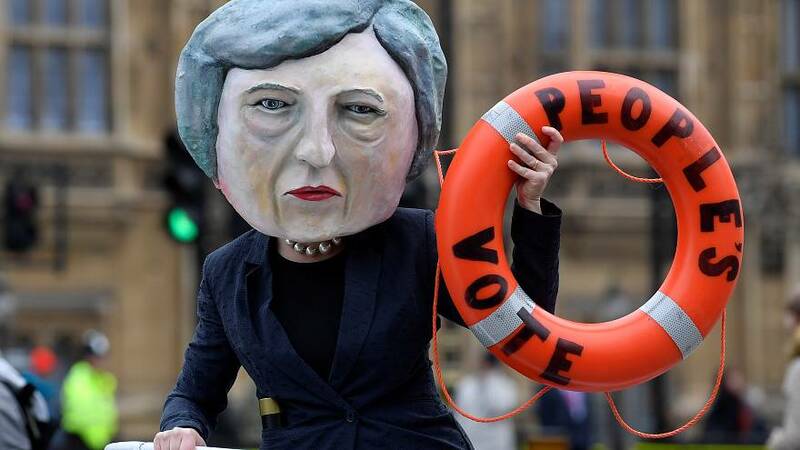 However, supporters of a "People's Vote" hope the idea will gain strength – particularly if May's Brexit deal is voted down again. Existing rules on referendums deal with the time needed for people to be consulted about the question by the independent Electoral Commission, for parliament to examine the legislation, and for the referendum campaign. The UK government estimates that it could take more than a year to organise another vote, Politico has reported. The publication highlights a document it says was drawn up by the Cabinet Office. The paper lists the stages that would need to be completed: drafting the bill, passing primary legislation, testing by the Electoral Commission of the question, passing secondary legislation, designating the official campaigns, and finally, a 10-week period for the campaigns to run. The document cites the timetable from the 2016 EU referendum, when the process took 13 months and cost almost £130 million (€150 million) – according to the electoral regulator. However, supporters of a second referendum accused the government of trying to undermine support for another vote. It has been pointed out that other countries have held a referendum in an extremely short amount of time: in 2015 Greece staged a vote on the EU bailout in barely a week. “With political will, legislation can be rushed through on significantly reduced timescales,” according to a study published last October by the Constitution Unit at University College London (UCL). Paul Tyler, a Liberal Democrat member of the House of Lords and the party’s spokesperson for constitutional and political reform, has estimated the whole process could take 16-17 weeks. The UCL report warns that given the polarised political environment over Brexit, the result of any referendum must be perceived as legitimate. The more complicated the question, however, with potentially multiple options, the more controversial it would be and the more time the process would take. Would the ballot be a straight choice between the negotiated withdrawal deal and continued EU membership, as Labour proposes? Or would it include a potential no-deal Brexit, the outcome many "Leave" supporters argue for? Or would it allow all three options? Simple UK parliamentary arithmetic suggests an added complication: given the lack of a strong majority and the controversial nature of legislation linked to a second vote, attempts to disrupt the process would be highly likely. A cross-party group pushing for a referendum proposed a mechanism to head off unnecessary delays, preparing a bill to allow the Electoral Commission to begin paving the way for a vote without having to wait for the main legislation to be passed. The UCL study also recommends improvements to the rules governing referendums and covers for example government activity, the designation of the lead campaigners, and financial regulation. There are recommendations regarding the quality of information available to the public: online advertising should be more transparent; broadcasters could develop fact-checking further. Unblocking the mess — or messing with democracy? “If the political will existed to hold a referendum in the UK, this would almost certainly be accommodated in one way or another by the EU27,” the UCL study concludes. Theresa May remains vehemently opposed to a second public vote, telling the House of Commons that such a move “could damage social cohesion by undermining faith in our democracy.” The prime minister’s Brexit strategy has been dedicated to delivering the result of the June 2016 vote when the UK voted to leave the EU. There have been warnings that another vote would create more uncertainty and division. Those who placed such faith in the first referendum would feel cheated. Depending on the question, a second poll could even bring another victory for “Leave” — exactly the scenario most second vote enthusiasts seek to avoid. However, many supporters of a public vote believe that if no majority emerges for any other outcome, it may eventually become the only solution left standing. Why did Brexit and Remain MPs reject May's deal?